The STOP:bit for the BBC micro:bit is the ultimate upgrade for traffic light/pedestrian crossing projects. Not only does it make coding the project a breeze, but the board is also supplied pre-assembled so you don't even need to fire up the soldering iron. Love it or hate it, variations of the pedestrian crossing project have been around for decades. When I did mine, it was on a 6502 EMMA board and coded with Assembly and it also included a level crossing. Thankfully, tapping low-level programming languages into a hexadecimal keypad is now a thing of the past. 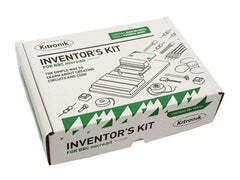 The Kitronik STOP:bit is a purpose-built accessory that can only lead to a more enjoyable project with a nicer looking end result. The STOP:bit is a bolt-on/clip-on board for the BBC micro:bit replicating a traffic light. The PCB has been designed to have the same physical features of a traffic light, with the addition of a BBC micro:bit as the pedestrian crossing control box. The STOP:bit has 3 10mm diameter LEDs. Each of these LEDs is driven from one of the BBC micro:bit IO pins. 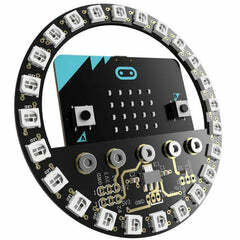 Power to the LEDs is supplied from the BBC micro:bit connections. STOP:bit is supplied with 4 countersunk screws which gives you the option of bolting the microbit directly onto the STOP:bit. 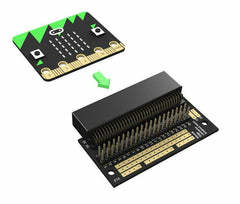 Alternatively, crocodile clips can be used between the pads on the STOP:bit and the corresponding pads on the microbit. If your scope is larger than a single traffic light, you can use the micro:bits radio module to communicate with other lights if they also have a microbit attached. This is great for exploring traffic management in a town or city. To add our custom blocks to the editor; Click on the cog in the top right of the editor and select 'Add Package' from the menu. This will open a dialogue window with a search box. Type Kitronik into the search box and all of our custom blocks will appear as tiles. Scroll down and select the tile titled 'kitronik-stopbit' and it will be added to the blocks menu.